Gina- "I trust her dreams were realized." I never met Gina, but did finally meet her family on my visit to Israel last May. Gina was the only survivor who has been positively identified by the soldiers themselves- in this case, George C. Gross, who took a photo of her in front of his tank on April 13th, 1945, before moving out to fight the final battle at Magdeburg. He always wondered what had become of her. I would challenge you to read the last paragraph of his narrative, especially. Then refer to the photo above. Gina passed away this week. I think that George Gross, who passed in 2009, helped to welcome her home. I spent part of the afternoon (13 April 1945) listening to the story of Gina Rappaport, who had served so well as interpreter. She was in the Warsaw ghetto for several years as the Nazis gradually emptied the ghetto to fill the death camps, until her turn finally came. She was taken to Bergen-Belsen, where the horrible conditions she described matched those official accounts I later heard. She and some 2500 others, Jews from all over Europe, Finnish prisoners of war, and others who had earned the enmity of Nazidom, were forced onto the train and taken on a back-and-forth journey across Germany, as their torturers tried to get them to a camp where they could be eliminated before Russians on one side or Americans on the other caught up with them. Since the prisoners had little food, many died on the purposeless journey, and they had felt no cause for hope when they were shunted into this little unimportant valley siding. Gina told her story well, but I have never been able to write it. I received a letter from her months later, when I was home in San Diego. I answered it but did not hear from her again. Her brief letter came from Paris, and she had great hopes for the future. I trust her dreams were realized. Today I had every intention to read aloud these paragraphs from Dr. Gross’ testimony to my 4th block tenth graders . I made it as far as the last two sentences, and had to stop, go back to my desk, and compose myself for a moment…when I passed around these two photographs and the email below, the kids understood…of course I reminded them that I was still a “tough guy”. I am referring to your amazing World War II project. Mr. George Gross whose testimony is found in your site mentions the story of Gina Rappaport (and includes her photo) who happens to be my mother (!). She survived the Holocaust and emigrated to Israel where she lives until today. In 1947 she married to my father and gave birth to two children, my brother Giora and myself. Could you please provide me with contact information of Mr. Gross? I would like to contact him as soon as possible. Thanks for your letter and for this fascinating project which is highly important for my entire family! I am enclosing a photograph taken yesterday showing my mother reading for the first time Dr. Gross’s article and watching her own photo in front of the tank. Thank you for posting this. I never met Gina, either, but I felt like she was part of the family. What a marvelous person. I will always be grateful that Dad finally found out what became of her and that he knew that she had such a wonderful family. Without your efforts that never would have happened. On January 2nd 2012 my dear mother Gina passed away. Many friends who came to our house during the “Shiva” (seven days of mourning) praised her unique character and admired her brightness and charming personality. She was a holocaust survivor who albeit extreme difficulties succeeded in raising a family here in Israel. We are all very proud of her. תנצב”ה (May her soul be bound in the bundle of life). My mother belongs to the generation who had the courage and strength to start all over again. She has been and will always be a role model to her family and friends. She is definitely one of those who made our country a “dream come true”. Unfortunately, Mat’s unprecedented and amazing project started too late for her. 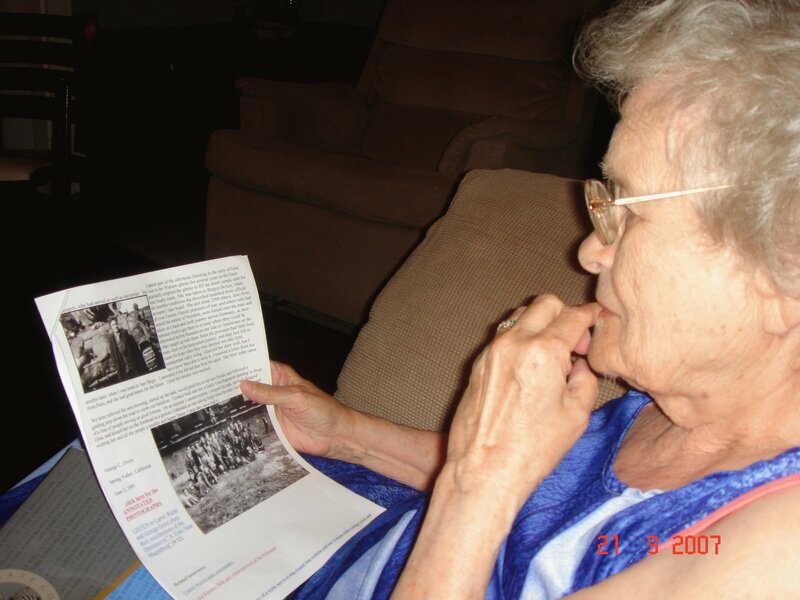 Due to severe dementia, she was unable to fully appreciate the meaning and importance of the reunification of the train survivors with their rescuers. Our entire family salutes the late Professor George Gross and his fellow soldiers of the United States army for rescuing the death-train near Magdeburg. These heroes will always be close to our hearts.